Real estate is often accomplished by investors through a short term loan. A short term loan is the solution to purchasing rental properties and also fix and flip homes. It is also used in purchasing homes as rental properties until a long term financing can be found. The use of hard money will more than likely be expensive, even more than what traditional financing would be, and it is best to have some short term financing to use. However, many investors find a hard loan as a terrific option, yet, this is going to cover short term financing options as well. You can also use a conventional refinance loan for purchasing rental properties without having to have the money to put anything down. Hard money loans, what are they? A hard money loan is something that helps an investor to purchase rental properties for a short term, usually six months or less. They will have different terms than the traditional bank loans do. Those who lend out hard money loans are going to have a much higher interest rate, with an interest rate of twelve to sixteen percent, plus points for the money they loan you. For those who do not understand what points are, it is a percentage of the amount of the original loan and accumulates other charges and can accumulate as much as four points rather quickly. Is there any certain reasons that an investor would use hard money to purchase property? Investor will choose to go through an investment to purchase a rental property with a hard money loan because the lender may be willing to cover the entire amount of the loan plus what it is going to cost them for the repairs, referred to as the after repair value (ARV). These lenders are willing to loan the investor as much as sixty-five to seventy percent of the ARV, you need to remember that that is not the purchase price, it is the price the house will be worth after it has been flipped. So, how does the lender make their money off of a hard money deal? For instance, an investor purchases a home for $60,000 and the after repair value is $130,000, the lender is going to loan the investor up to seventy percent of the after repair value of the property. This means that the lender is going to loan the investor up to $91,000 on the property based on the after repair value. Estimates of all repairs have to have bids and receipts and the lender will cover those costs as part of the hard money loan. The lender is going to be paying twenty-five percent of the repairs at the closing and the rest of the payments will then be in twenty-five percent increments as each repair is finished. The loan principle, interest, and points will be paid in one lump sum after the house has been sold. The lender isn’t going to charge any interest until after the house is sold, however, the lender in this case is going to charge a fifteen percent interest along with the four points, which they are willing to reduce the points paid if you do some deals with them. When dealing with a hard money lender the cost to you can add up quickly. The interest alone for this deal is going to cost you $6m825 plus the points is already $3,640 for a six month loan. You may find a hard money lender that is will to lower the charges on interest and points, of course these are going to want you to share the profits evenly with them. Personally, I never use a hard money loan, but the options are there for those who have no other options. How do you locate hard money lenders? Hard money lenders are out there, many of them will only do business in certain states, while others may do business across the nation. Begin by searching on the internet for a hard money lender in the same state you live in, using any of the search engines. Here is a few hard money lenders in case you would like to talk with more than one: Located in Phoenix, AZ is the Brad Loans, and there are the Private Money VS. Hard Money for Investment Properties. What is Private Money VS. Hard Money for Invest properties? Private money is when you are getting the money from someone, not from a mortgage co. Or a bank, or any other type of lender but from a person. Sometimes a regular person will loan the money needed for real estate property, especially right now, with interest rates as low as they are. Right now the average interest rate on a CD is under one percent. No one can keep up with the ongoing inflation with the interest so low. While the wealthy is now looking for higher yield investments while they are still secure others are buying up properties. By loaning out to investors could be the perfect thing for them at this time, increasing their investment returns and helping investors out, this is called Private Money Loans. How would you go about locating Private Money investors? The hardest issue with private money is locating someone that will loan you the money. If you go online you can find many websites that say that are private lenders and that you can borrow money for a fee. From personal experience, this is not the way to go about it as you don’t never know if they are just going to take your money and give you the name of hard money lender or what. Private money lenders are more cautious than that and they only want to do business with people they know they can trust. The best private money loans comes from someone you know and can trust. For instance, My private money loans have been coming from my sister, she uses her profit returns towards the increase of her son’s college fund. And she will lend me the money for an eight percent rate which is reasonable, without any points added in there. She knows that I know what I am doing and that I am going to be honest with her. This is a lot cheaper than financing with hard money. 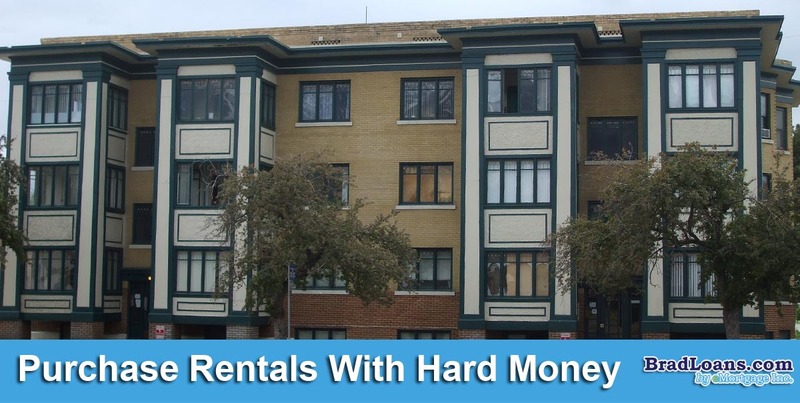 Can I purchase rental property with hard money without having any money to put down? You can refinance a hard money loan if you used a hard money loan to also finance any repairs, using the Fannie guidelines, of course it has to be with a seasoning period. There is not cash out refinance allowed it you do not have a seasoning period. This gives the home a higher loan amount than its original cost since the repairs have also been financed. It means that you will be able to get the long term loan to take the place of a hard money loan and don’t have to wait around as you would if it was a hard money loan. For instance, you purchase a rental property for $100,000 using a hard money loan of one-hundred percent of the purchase price with another $35,000 financed for repairs, making it a total of $135,000 in loans then you refinance after the home has been repaired using a Fannie loan making the loan amount go up to seventy-five percent of the new appraised value. The if the new value is appraised at $185,000 the amount that you could refinance would be $135,000 but according to the Fannie guidelines you cannot cash out a refinance. However, the original amount loaned to you by the hard money lender could be refinanced. Going this route tends to be more expensive because it has a higher interest rate, then there are the added points, and the costs of the refinancing with Fannie Mae, but keeping in mind that you have just purchased a long term rent property, repaired it, and had almost no out of pocket expenses. Investors can find banks that are willing to give them a short term loan, although they can be hard to locate and usually the investor will already have a good standing with the bank. Our short term loans are done through a portfolio lender to finance our short term investments. The portfolio lender will have an interest rate of about 5.25 percent, with 1.5 percent on the loan. This means we can get up to a seventy-five percent loan on the original value of the purchase price, but we can complete the loan process in a couple of weeks. There were times in the past that a bank would finance these loans at a hundred percent of the value and the funds would be ready on the same day, but, not any longer. Lines of credit are offer by traditional banks, however, they are not referred to as short term loans. Those banks will usually want something such as real estate or other value property for collateral before giving anyone a line of credit. So, if you have a home and you have equity in it you should be able to get a line of credit. The bank I deal with charges a five percent interest rate and allow up to ninety percent towards the value of my residence, and I can get up to eighty percent on investment properties. Give us a call today if you are interested in hard money loans for fix and flip, finishing construction, refinancing your mortgage, buying land, or need loans for other investment opportunities but have bad or no credit. Give Brad Loans a call today at (602) 999-9499.